Manuel Neuer believes Bayern Munich have nothing to fear from Anfield ahead of their Champions League clash with Liverpool later this month. 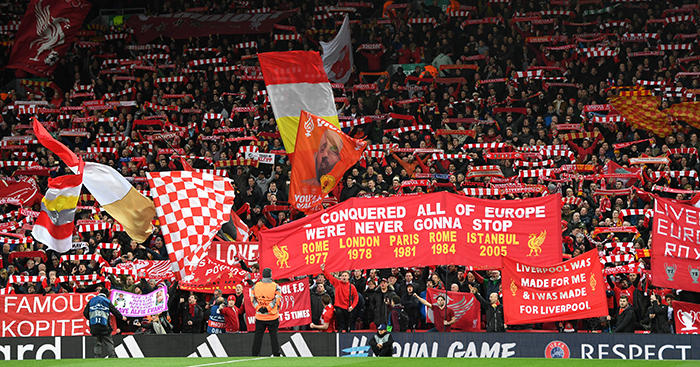 ‘Famous Anfield European nights’ are part and parcel of the Reds’ illustrious, continental history with many a side falling foul to the special atmosphere built for such occasions. In Jürgen Klopp’s time on the red half of Merseyside alone, Liverpool have memorably seen off the threat of the likes of AS Roma, Paris Saint-Germain and Borussia Dortmund in front of their home fans. Prior to this season’s round-of-16 tie, Bayern Munich remained the only major European giant not to have faced off against the Reds since they first competed in the Champions League in 2001/02. And while Bayern’s players are well aware of Liverpool’s European pedigree, Neuer is looking forward to his first taste of Anfield and confident the Bavarians can produce a famous European night of their own. "We have heard a lot about the atmosphere in the stadium,” he told ESPN. “Everyone who watches football knows it's special, and I think they will be two great games. "It's the first game for me at Anfield. I'm looking forward to playing there. Meanwhile, team-mate James Rodriguez is also confident of Bayern progressing in the competition at Liverpool's expense. "I'm very much looking forward to facing Liverpool," he told Bild. "You can't make mistakes in these games. "I think we can cause Liverpool problems. We have a team that can go through if it goes well." Looking forward to this one very much. I have every confidence in our lads, the boss and all of you Reds going to Anfield on the night to make it another one to remember. Can't come soon enough! Come on you Reds! Massive game against a massive team. Two giants of European football coming together for a slugging match. Anfield will be f**king buzzing and rightly so. Can’t f**king wait to watch this. Nice break from the pressures of the title race. Let the hair down and nail these before we travel to OT and batter the Mancs! Hard to beat the CL for one off nights, atmosphere will be brilliant, and the football usually lives up to the occasion. Hearing the CL anthem and YNWA sung out, it's emotional stuff. Can't imagine Jürgen will have too much problem motivating the players, the noise and seeing Munich line up should handle a lot of that. Would expect them to come out of the blocks like Ben Johnson on twice his meds. Absolutely can't wait for this, and great to be going into it off the back of a good performance. I guess Neuer is back. Lovren 100% won't be fit? Guess he doesn't have a lamp? I’ll take a repeat of the last time we played a European power house, and then went to the mancs , take a bow Dossena . I love him but I want him to be fresh for Manure/League. Keita is experienced player who knows them enough. We're playing Tuesday night and Sunday night, so should be okay in terms of fitness. Watford at Home the following Wednesday is where we might shake things up a bit. I think this will be the midfield vs Bayern, but wouldn't be against Milner coming in for Keita as long as we counter press the fuckers like there's no tomorrow. Would keep the team that played well against Bouremouth, though with TAA if fit. Home leg, need to put up some scores. Get ahead and bring guys off if needed then for the PL match following. VVD is banned for the first leg mate. Torn on this because I don't feel we have the quality at the back anymore to win the competition so I'm thinking why bother, just focus on the league... then I'm thinking at the same time it's such a prestigious cup we should go full strength. I'm arguing with my self on this one. If you look at that X1, there's not one player playing out of position ? I don't want to be disrespectful to the CL, but for me for this season in particular we should be putting all our eggs in the title winning basket, of course getting through would be fantastic but going out could give us a massive shot in the arm playing only once a week, in the title run in, going out at this stage would not be the end of the world would it ? Yes its a gamble, but so is playing players out of position and so is weakening your midfield ! We have got somthing to lose. No use gambling on playing a kid in Hoever. He looks promising and could become a beast but you risk losing goals to a hugely experienced side who will no doubt be looking to ask questions of a 17 year old lad at the heart of our defence. Plus you risk destroying the lads confidence. Throwing him in at the deep end in a huge game is not the answer for me, not good for him or or the team in my opinion.